My new writing spot has become just what the title of this blog post says, a procrastination station. The sun makes me sleepy and I lose all my motivation to do anything but sit and bask. Today, my 2014 total is stuck at 18,234 which is a harrowing 23,000 words behind for the month. I announced that I was going to try for 4,000 again today but I’ve self-sabotaged myself completely out of that unless I plan to write all evening. My pace has been slower than normal for the last week, barely hitting 500 words an hour at my top speed. Today I’m sitting at 297 words an hour. 4,000 words at 297 an hour? That’s like … be right back, I need my calculator … 13 and a half hours! Yikes! So technically if I stayed at that pace, I won’t even hit 4,000 before midnight and the day is officially over. I’m also struggling to not worry about how much everyone probably hates my books. Which is stupid. I have some lovely emails from fans and blog comments and 5-star Amazon reviews and 5-star ratings on Goodreads, so all I’m doing by doubting that my books are any good is doubting the intelligence and truthfulness of those fans, which is not something I want to do. But I’m still doing it! Apparently. Why can’t I just write and not think of all this stuff? *Fake hard, because really, my dad was a mason who went out and lifted blocks and bricks and squatted in the mud and slapped mortar down and made things that looked pretty out of that mess in scalding hot weather and breath-stealing cold for many years and that was hard. This isn’t hard. Just mentally frustrating. Or I’m just a whiner today. I blame it on the sun. Now I feel kind of like I need to show some grit, because everybody knows grit is what makes the world go round. I know this one too. FWIW my bouncing-ball-non-chair-thingy collapsed under me a couple of days ago and I haven’t found a decent replacement. Thus, I am standing at my desk and using voice recognition software for nearly everything. This has totally crashed my productivity. Note: I could take a laptop, or an AlphaSmart Neo (my first-draft ace) to a table about forty feet from my office. Or bring a kitchen chair into my office. Or go to a coffee shop. Instead I am playing with toys. That said? At least while standing I have no urge to take a nap. And browsing the internet with my voice is just not that interesting. Actually I’ve raised one of my monitors up to standing-eye-level, and I used to stand at my desk all the time, so it’s not quite as bizarre as it sounds…I just haven’t raised the keyboard this time. 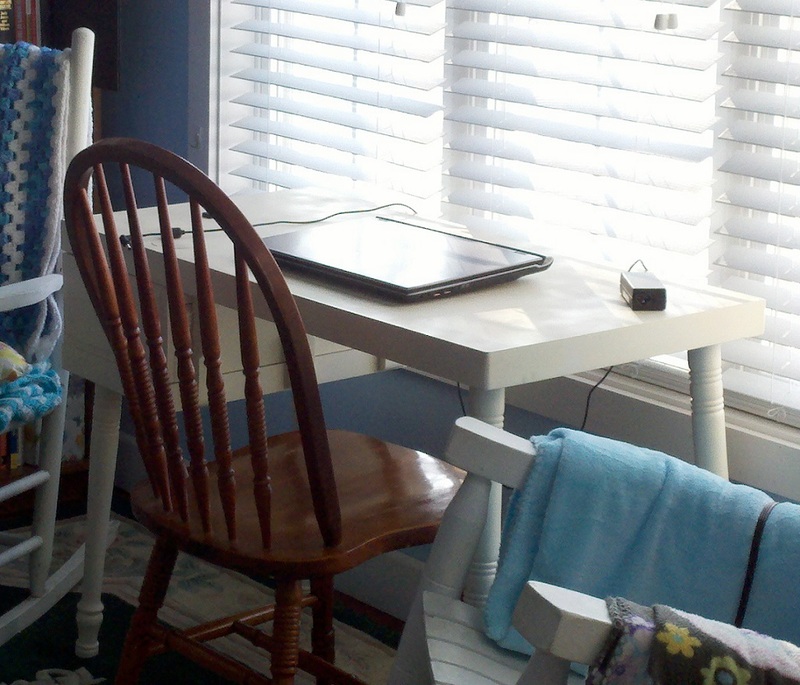 And I miss my treadmill desk–I built it myself, but the treadmill didn’t make the cut for our most recent move. Slightly more seriously…I’ve always found lots of reasons not to write, many of them involving the idea that I’d absolutely, definitely, totally write more if I just moved myself physically to a “better” spot, or if only my office had…whatever essential item has most recently captured my imagination. And I have no doubt I’ll find even more plausible excuses in the future. That Pomodoro timer thing is the only solution I’ve found that actually works. And now the sound of the timer, ah, eggs me on. Must type! Or must keep talking! Pauses are for the weak! Oh yes. I know the feeling well. I often think if I could just get comfortable, I could write and write and write and all would be well with the world. And then I sit for two hours with my laptop on my crossed legs reading something or browsing or organizing my email and look up and realize I really should be writing instead, but of course, by then, I really am uncomfortable and I need to move, and when I do, I need a few minutes to settle in before I start writing. And then, of course, I start the whole process over again. :D I do know a thing or two about self-sabotage. Even with my schedule, I run my timer while I write. It does help. I set it for 2.6 hours and pause if I have to take a break. Now if only I could get myself to the point where I don’t want to push pause unless my house is burning down around me, I might be okay. I can’t walk away while the timer is going, but the pause button is just too easy. I know what I need! I need a timer that won’t let me stop it once I’ve started it that I can set for at least one half hour increments—although 1 hour increments would probably be even better. :D Oh, wait. Then I’d just feel compelled to only start it when I was positive I would be able to stay focused and would probably end up writing less than ever. Yep, Kevin J. Anderson got me started thinking about dictation. Then I tried Linux-based software & gave up on it. Now Dragon seems to be working okay (under Windows only…curse them), as long as I view it as a plain-text-creator only. Which is okay I guess, ’cause my AlphaSmart Neo (my real first-draft champion, when I’m not being goofy) is also a plain-text-creator only. In fact, I am currently moving the text I get via Dragon to my Neo, which then emulates a keyboard and types it into Scrivener, which then uses smart/curly quotes and gets ’em mostly correct. And I wrote a quick little app to strip out the extra spaces Dragon puts between paragraphs, too. The ball dingus is pretty easy to sit on actually. I had mine sorta stretched out so I’d have to work at it, which may have contributed to its demise. ATM I’m using my wife’s, though, and it’s so short it might as well be a regular chair. Pointless. So in the midst of all this? I decided to try Freemind as an outlining tool, not necessarily to outline stuff in advance but more to keep track of my WIP as I go (and maybe get a day or partial day ahead at times). So far I like it–it does a lot of things I’ve been trying to use Scrivener for, only better. I like the idea of Scrivener, but in practice it’s just too awkward. So I have to drag stuff around in Freemind, then do the same drag/drop operation in Scrivener, but I’m sure I’m saving time overall in spite of that. And I also ordered a stationary semi-recumbent bike dingus that Amazon reviewers claim is nearly silent, to use as an indoor dictation station. ‘Cause I think a treadmill might be too noisy. And my downstairs neighbor hates my pacing. So does one of my cats. FWIW some of the Pomodoro timers I’ve seen are configurable, and some don’t allow a “pause” at all–you either complete it or start over. I’m not using one of those, but I am thinking about it. Also I keep thinking about “Write or Die” (http://writeordie.com/). Not to the point of trying it. Yet.